I have always wanted to be a writer. My earliest memory is of seeing a no-smoking sign and being incensed that I couldn’t read it. I had a gut instinct that if I could learn how to read, I would gain the capability to open doors I didn’t even know existed – and I was right. Thankfully my mom took pity on my frustration and became my own private tutor, teaching me phonics, basically letting me live at the library, and reading and occasionally editing my incomprehensible marker-squiggle stories. In first grade I wrote in my school journal that “I can’t wait untill I can have a puplished Book.” Writing was everything. When I was nine, I decided I was old enough to start working on that goal of getting puplished, and a few years of effort and ten rejections later came a cover story for the thirtieth anniversary issue of the children’s magazine Stone Soup. After that came a spate of ambitious novels, none of which were ever finished. When I was about nine, my mom gave me a book for young musicians. It was split into quarters: trumpet, flute, piano, and violin. I’m nearly certain she meant for me to read the piano part, but I found myself lingering in the violin section instead. Something about the instrument fascinated me. Violins were small and portable – had strings you actually touched – were beautiful, and so much more unique than pianos – could be played in so many different contexts – and you only had to read one clef. I was sold. My family had no money for a violin, and so to make my point, I took some cardboard, brandished a blunt tip scissor, and created this. I have no memory of this. But I do remember going to my first violin shop after my family relented, and having my breath taken away by the rows and rows of curvy golden brown fiddles. Something deep within me felt as if it was coming home. I took a rental home and began to play, convinced that my first note would be beautiful, thanks to all I had learned on my cardboard violin. Naturally I made the most hideous screech imaginable. I have always wanted to be a historian. I’m most interested in the Victorian and Edwardian eras. In fourth grade I decided that when I became an adult, I’d never drive a car; I’d use a horse and carriage instead. In fifth grade I read my first Sherlock Holmes story. It felt like I’d found a literary soul mate. In 1999, while at a local antique shop, I bought several letters dating from the 1880s that were addressed to a Miss Nellie Pringle of Hastings, Minnesota. I obviously didn’t know it at the time, but finding those few dusty letters would turn into a truly massive research project that has lasted for twelve years. Over the course of it, I have made some of the greatest friends imaginable, both living and dead, and discovered how truly deep and nerdy a passion I have for research and primary sources. Few things are more thrilling to me than combing through brittle yellowed old letters that haven’t been opened for a hundred years. There are always surprising secrets waiting to be uncovered, and I know from experience that those secrets have the capability to change how you think about history, and in turn how you think about yourself. I have a tendency to obsess. I once had a teacher tell me, “You must be having difficulty deciding what you want to go into, since you have so many interests.” Until then, I hadn’t really thought of the decision in those terms, and the realization that there would ultimately have to be a decision paralyzed me. Which is it? What do you want to give up? The way time melts away when you’re writing something particularly absorbing? The comfort that comes from practicing a passage on the violin over and over and over again until the intonation rings perfectly true? The exhilaration of combing through old papers and finally latching upon something that sheds light on mysteries you’ve pondered for years? What will you give up? What will you choose? I have to decide between my two passions – history and writing, or musical performance. Of course it’s silly to think about it. I don’t know if I’ll finish my course in time to take that silly test anyway, and who knows, maybe my wrist will flare up again in the spring, preventing my playing, but this conflict is symptomatic of a larger problem – sometimes you have to choose between things you love. And I don’t like that. At all. I’ve only recently come to the realization that maybe I was wrong. Maybe I don’t need to choose. 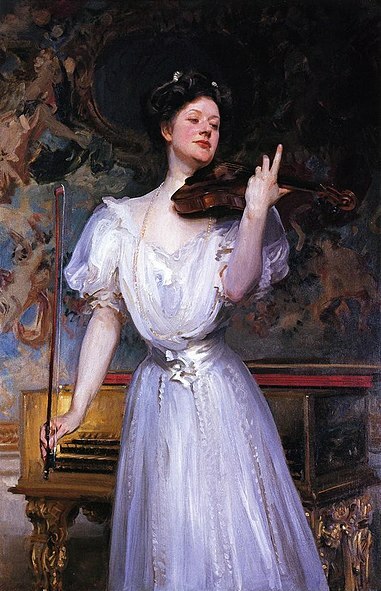 I’ve become more and more fascinated with writing musical non-fiction, and I’ve discovered a brand new passion (read: obsession) for researching female Victorian violinists, and those two things draw neatly on all three disciplines. Maybe – just maybe – the three can interlock with and inspire the others. The first person to play the Elgar violin concerto was an extraordinary, now largely forgotten, woman named Leonora von Stosch (later Lady Speyer). She was a much more accomplished woman than I’ll ever be, but she too struggled with competing passions: she was an internationally renowned violin virtuosa who in 1927 won a Pulitzer Prize for her book Fiddler’s Farewell. In 1919 she remarked to an interviewer from the magazine The Bellman, “The bird, the wind, the sea, the heart of man, all sing: the musician writes down the melody, the poet the words; the song is God’s. If you have a message and can give it, and can reach another soul with your singing, then all is indeed right with the world.” The song is God’s… Her philosophy is heartening, especially since she obviously knew what she was talking about. This blog is an attempt to chronicle my efforts to marry all three of my passions, and to live happily ever after with them in a blissful state of intellectual polygamy. The site will, in time, contain music reviews, essays on various historical musical pieces and personages, interviews…possibly even the occasional snippet of musical fiction. (Possibly.) It would be an honor and a privilege and a joy to have y’all along for the ride. And I promise things won’t be so egocentric from here on out.